This month’s partner for Taste & Create was Min of Bad Girl’s Kitchen. She has a large and eclectic collection of recipes, so I had a tough time choosing. I was very tempted by the “French toast souffle“, which sounded like a fancy name for bread and butter pudding (why haven’t I posted my recipe for that yet? 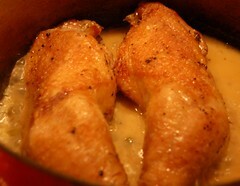 ), and I nearly chose the poulet au porto, which I remember making once many years ago. But time constraints got the better of me, and in the end I did something quick, simple and tasty, using a couple of gigantic chicken legs and ingredients I always have in the house (I was shocked that anyone would run out of lemons as Min did). I made the sauce with a fruity organic Chardonnay from Gérard Bertrand, which we drank with the meal too. I had to use dried thyme, but fresh would certainly have been better. Or you could use rosemary as well/instead. I humbly apologise for the hastily snapped picture and suggest you go and look at Min’s instead. Actually even in her pictures the sauce isn’t very photogenic, given its greyish colour, but it’s delicious. This was a nice way to ring the changes and make something that tasted special while not requiring much hands-on time. We had it with bread to mop up the sauce, but a potato gratin would be nice with it too. Oh this is one of our favorite recipes! I love chicken with fabulous sauce, of any sort. Glad you enjoyed it.